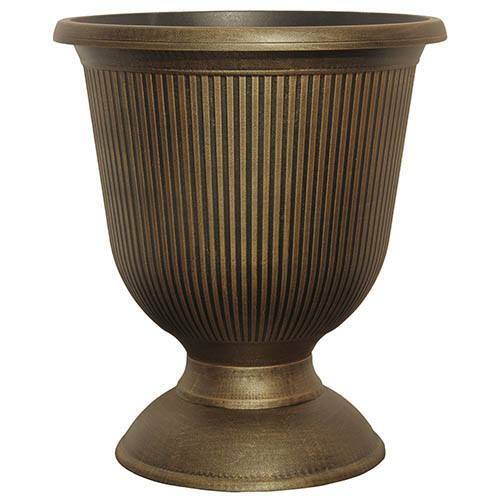 Create a stylish focal point in your garden with these stunning, lightweight planters. Perfect by doorways, gateways, pathways and patios. Supplied as a heavy duty polypropylene pot, approx. 16in (40cm) tall and 14in (36cm) diameter. A wonderful way to add height and impact in your garden, this classic shaped garden urn with a contemporary finish brings an elegant touch to any garden. Standing at 40cm tall, it's perfect for creating a focal point in the garden with a feature plant such as a cordyline, golden cypress or similar plant with height, surrounded by bold summer bedding and perhaps some trailing ivies or foliage plants that will cascade over the edges. Perfect by doorways, gateways or line pathways and give a real grand look and feel to your home and garden. What’s more, you won’t get this Urn anywhere else – it's totally EXCLUSIVE to us! Made from a durable UV stable plastic, and hand painted with a black bronze finish.